Must the car dominate Stonehenge 30 years on? 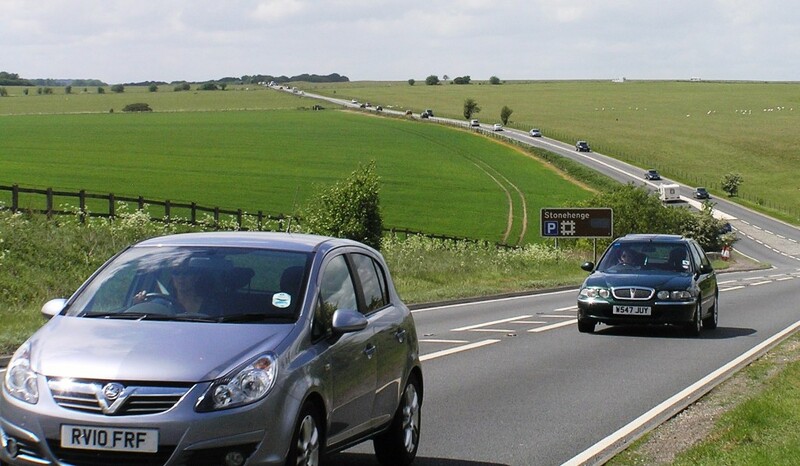 Traffic on the A303 is seasonal and cuts across the Stonehenge World Heritage Site. This year marks the 30th anniversary of the designation of the Stonehenge World Heritage Site, now under threat from major A303 Trunk road widening in an attempt to reduce congestion and journey times. Stephen Joseph, Director of Campaign for Better Transport reflects on other 30 year anniversaries with lessons for the A303 by Stonehenge. Recent weeks have seen a couple of other 30 year anniversaries, that the media have more or less ignored, but which had profound consequences for the way we travel. First, there was 29 October 1986. This was the day the M25 opened in its entirety. 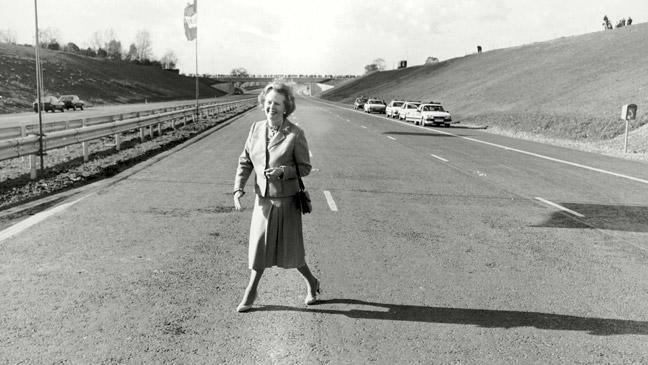 The then Prime Minister Margaret Thatcher performed the opening – there are pictures of her on an otherwise deserted motorway. It was a practical illustration of the “Great Car Economy” that she praised in later speeches. It had taken over a decade of planning and construction, and the M25’s origins went back much further, to post war planning for London and the surrounding South East. Latterly, it was one of three Ringways, orbital motorways around or in London, and the only one that was finished. They were supposed to solve London congestion and respond to rising car ownership and use. The same thinking led on to a 1989 Government road building programme, described by the then Transport Secretary as “the biggest road programme since the Romans”. But in fact, the M25 became a by-word for traffic jams. Rather than acting as the “bypass for London”, it generated lots of local traffic, spurred in part by developments around it, like the Lakeside Shopping Centre in Essex. Extra lanes were added in the 1990s, but traffic, and therefore congestion, increased with those extra lanes. It became an illustration of a truth, increasingly accepted during the 1990s and 2000s, that it’s not possible to build your way out of congestion, because road building simply generates traffic. When the Labour Government came to power in 1997, they scaled back the road programme and commissioned a series of “multi-modal studies”, including one for the M25. The main consultant on that study described widening the M25 as being like “digging a ditch in a bog” and recommended forms of road charging or traffic restraint instead. An earlier road-widening and short tunnel scheme at Stonehenge was thankfully withdrawn in 2007 largely owing to cost. All of these lessons appear to have been forgotten. We are back to an era of road building, with a universal belief that it’s possible to meet demand for road use by building and widening roads. The “predict and provide” forecasts and models that justify road building, based on extrapolating past trends, are still in place, despite noises about moving to a range of scenarios instead. There is serious talk of double-decking the M25 to cope with future traffic growth, especially around Heathrow with a third runway. Issues of air quality and climate change are ignored, because of a belief (not founded in any serious research) that all cars by 2040 will be electric, and possibly driverless too. Meanwhile, on 30 October 1986, bus services outside London were deregulated. This was supposed to reverse previous declines in bus use – in fact if anything it accelerated it. “Bus wars” broke out on various city streets, as rival companies raced to pick up passengers. Integrated ticketing and low fares policies, like that adopted by South Yorkshire Council, disappeared. Gradually the industry consolidated, and indeed has invested in new buses and on upgrading the offer on key routes. However, the split between “commercial” profitable routes and council-subsidised unprofitable routes and operations at evenings and weekends – effectively a prohibition of cross-subsidy – has, with local council cuts, seen a near-disappearance of socially necessary services in some areas. So these weeks in 1986 saw two major events that together massively increased people’s dependence on cars as the only way to get around. Buses became less useful and attractive as an alternative to cars for many journeys, and Government investment became focused on roads, especially for local transport outside the big cities. These were combined with a deregulation of the planning system – Nicholas Ridley, the architect of bus deregulation as Transport Secretary, moved on to the Department of the Environment and allowed through on appeal a large number of car-based out of town shopping centres and housing developments. The abolition of the metropolitan county councils and the Greater London Council, also in 1986, further weakened attempts to link land use and transport planning. Some of this is now being reversed. The creation of an elected Mayor for London, with Transport for London as a co-ordinating and planning authority, is seen generally as a success, and next year there will be elections for mayors for some other city regions, like Greater Manchester, the West Midlands and Merseyside. A new Bus Services Bill will give these mayors powers to franchise bus services in their area, reversing bus deregulation, and these powers may be available to others, alongside new and stronger partnerships between councils and bus operators. New sub-national transport bodies like Transport for the North are being created too. Until the lessons from the M25 are fully learned, and there is a framework for providing and investing in alternatives to car travel rather than simply adding lanes to roads and tackling “pinch points” (which usually just moves traffic jams elsewhere), we will continue to be suffering from the 1986 transport and planning deregulation, and the congestion, pollution and car dependence that has brought. A lesson well worth bearing in mind before road widening damages the Stonehenge landscape – and proves to have been unnecessary within another 30 years. Please take action. Please link here to sign our petition. Thank you.